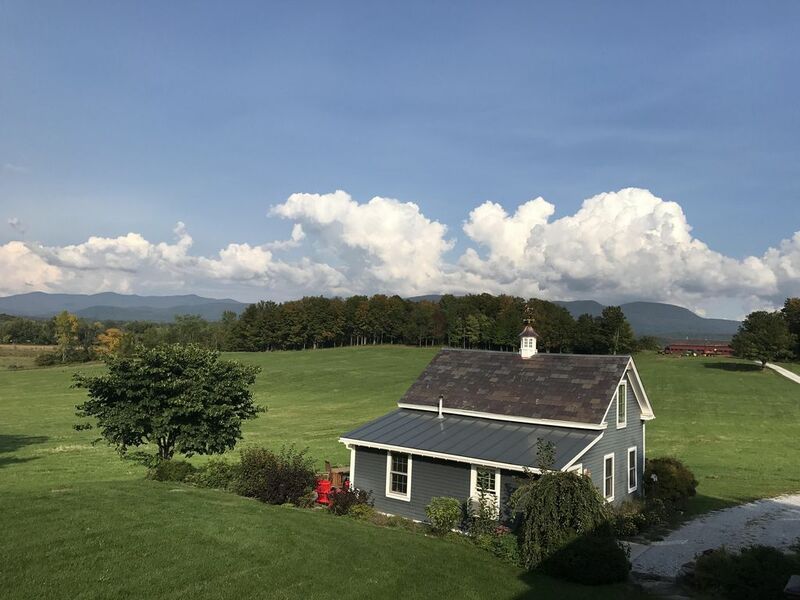 In Brandon, VT, on our large organic farm with exquisite views, The Swallows Nest guest house is a luxurious place for a romantic weekend getaway, or extended vacation. 'The Nest' is surrounded by meadows and has views of the Green Mountains and countryside. It’s very private. On a dead end road that feels world’s away. Sleeps 4. Brandon's many shops, restaurants, and galleries, have gotten noticed! Brandon’s been recently called the "coolest town in Vermont, "
and Expedia, in 2018, chose Brandon as the best town in Vermont to escape to. A properly equipped full sized kitchen, newly furnished interior, meticulous housekeeping, and crisp linens will make your stay luxurious. Enjoy world class music at Brandon Music, opera at Barn Opera or visit Warren Kimble’s new studio. Come experience Vermont at the Nest! which will do your shopping for you and have your food waiting for you when you get here. The Nest has a private bedroom with a queen sized bed and a loft with two twin beds. There’s a shared bathroom on the ground floor. We are a family with deep roots in farming and education. We also love acting, music, art and writing. Here we can combine so many of the things we love and gather inspirations for projects. We first saw our farm in 1990. It sold twice to owners who never lived here. Finally 23 years later we bought it and moved in. At the end of a dead end road, it has it all: privacy, wildlife, bucolic farm views, Mountain View’s and pond views. Our large, tiled bathroom has a custom cherry vanity and cabinets. A full size washer & dryer are available for your use. Iron, ironing board, and hair dryer are also available. Brandon is a lovely artsy, town, with a growing and serious local music scene from bluegrass to Barn Opera https://www.sevendaysvt.com/vermont/ArticleArchives?tag=BARN%20OPERA . We have a marsh teeming with wildlife three seasons of the year. We have a beaver pond on the property. It''s not great because we are so far from the last cable provider and have it through our telephone line only. It has a DVD player but no cable. We have a raised bed with herbs planted for guests to use while cooking. For an added fee we can rent bicycles for you that can be delivered to the Nest. There is the Neshobe Public golf course about 3 miles away. There are added fees for massage, housekeeping or a private chef. Call ahead for availability and fees. This is our second time renting the Swallow's Nest. Our son attends Middlebury College and this location is a peaceful, beautiful oasis. We love, Lyn, who owns the house. This trip we were even spoiled by resident honey and a pan of yummy brownies! We shared the brownies with a grad party. They were a huge hit;) There is a LOT of nature here. If you are not used to birds' singing early morning, bring some earplugs. It is part of the attraction for us but just fyi. Thanks, Lyn! Hopefully, we'll be back again. Thank you Mona, we so enjoyed having you back. Jim and I love sharing our farm with families like yours who relish every minute of their farm stay and appreciate the wildlife, birds and seclusion. The property is clean, very well maintained on incredibly beautiful land. We enjoyed the privacy and the amazing views from inside the cabin. The mosquitoes were particularly vicious so enjoying the lovely deck & grill was not possible the weekend we visited. The kitchen is well stocked & we were happy to find it has a Keurig coffee maker. The kitchen has plenty of utensils, pots & pans etc. Having the washer & dryer was a huge bonus. The beds are all on the second floor. When you get to the top of the stairs, the two twin beds are immediately to the right and a private bedroom with the queen sized bed is to your left. The air conditioner on the 1st floor cooled the 1st floor very well but the 2nd floor remained quite warm. I was thrilled to find that the very long leather couch in the living room is incredibly comfortable and I slept there. My husband didn't mind the warmth on the 2nd floor and said the bed was quite comfortable. There are two casement windows opposite each other on the 2nd floor so if there's a breeze you'll get some airflow. We look forward to staying there again. Thank you Lyn! We look forward to having you again as well. We hope as you come to Keewaydin you'll stay again. We will ensure we add a fan to the second floor!!!! Overall, really 5 stars. Gave 4 only because we were looking for accommodations for 2 parents and 2 college age kids. Sleeping arrangements were cozy, with 2 day beds for the college kids right outside the master bedroom. Would highly recommend for romantic getaway or couple with smaller children. No cable TV but I was happy for the break (and they did have wifi for the college kids). There was a TV for DVD playing and a selection of movies (we watched 2 as a family ... kinda nice!). I loved the house ... very clean, modern with quaintness of a guesthouse sitting on a farm. While the freestanding home sits close to the main house, the hosts were gracious but kept to themselves unless needed. Full kitchen with plates, appliances, etc. and washer and dryer. The view was spectacular -- I would imagine even better in the summer (we were there in November). Last but not least, she left eggs, bacon, milk and pancake mix so we didn't have to find our way around first thing in the morning (we arrived after dark). Nice touch! We stayed at Swallows Nest for 10 days during the peak time of fall foliage in Vermont. We have never stayed any one place that long on a vacation. We loved the peaceful setting and being able to explore the many quintessential New England villages all within an hour drive or so from Brandon. Whether you want to hike the mountain trails, visit historic sites, explore the mountain roads for fall colors, shop at unique shops, the Swallows Nest is the perfect launching ground for your exploring. And I can't even begin to describe the vibrant colors and a lot of them were on the farm. Lyn invited me to explore their property and I did on several walks. I think I took a few dozen photos just of the spectacular tree colors and views on their property. As for place to visit in Central Vermont I highly recommend visiting the Calvin Cooledge birthplace at Plymouth Notch, Shelburne Museum, the Vermont Country Store at Weston or Rockingham, Manchester for shopping (and seeing a beautiful town), and Sugar Shack in Arlington for the Norman Rockwell Museum. There we actually got to meet and talk with one of the local residents who modeled for a famous Norman Rockwell Saturday Evening Post cover. That was cool! And speaking of cool... the coolest thing we got to do was take a hot air balloon ride on a cloudless, crisp fall morning. I highly recommend the Balloons Over New England out of Quechee. The crew made us feel at ease and gave us a great flight. All in all it was the trip of a lifetime, thanks in no small part to the beautiful peaceful setting of the Swallows Nest and the hospitality of Lyn and Jim. I highly recommend staying here! Thank you for staying with us. You were lovely guests. Perfect for leaf peeping in Vermont! My elderly parents and I stayed at the Nest for 3 nights as part of our leaf peeping tour. It was also conveniently close to Middlebury College, where we visited my son. The home was relaxing and beautiful. Lyn, the home-owner, could not have been more lovely and accommodating. It is a great place to escape any hustle and bustle. We would stay there again! We stayed at this beautiful property for a weekend to attend a wedding in Middlebury. The Swallows Nest was perfect! We met the owner Lyn who was warm, welcoming and very willing to give us information about the area. Lyn gave us a history of the farm the amazing repairs that they have done to the barns so far and what will done in the future. So many birds, turkeys, geese, herons, ducks, hummingbirds, of course swallows and a furry woodchuck. The cottage was very clean, comfortable, quite and had everything you could need. We would and will definitely stay here again and recommend to friends. One thing to note, there is NO TV. Which is FINE by me - great chance to disconnect from the world. Wi-Fi is available. Thanks so much for a great stay! Rates are subject to change. For May and Foliage seasons, we require full payment 90 days in advance.